I started this design over a year ago but was external presures delayed the product release. Pre-production units are now available at a target price of Euro 550 with a Real Time Clock option to provide a time of day output will be available for Euro 150. 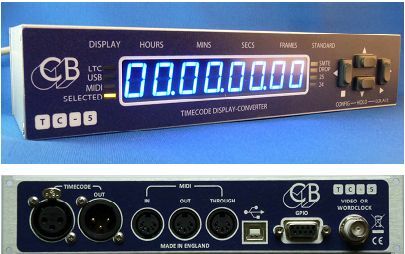 The TC-5 is a 1/2 rack timecode Reader/Generator that can display and convert LTC, Midi and USB Midi. 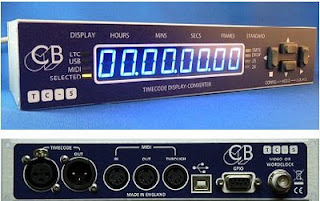 One of the main features is that after setting up the required timecode conversion the display may be used to check at the different timecode inputs without disturbing the timecode output. The TC-5 also includes a number of test functions, including difference, and reference rate measurement. We are so pleased with this product that we have one on every test bench. No doupt using them on our test benches will result in extra test functions being required! Last week I spent several days on the sync separator software used in several of our designs. Eventually I had to change the algorithm so that the various factors involved did not interact. The result is a much more stable sync separator for the P2MMC, Euphonix TT002, and the Nuendo SyncStation. You can download new software for the P2MMC from its product page, I have sent an update to Euphonix (Avid) and will send a update to Nuendo later this week.